The artist Kerry James Marshall standing next to “A Monumental Journey” on 11 July 2018. 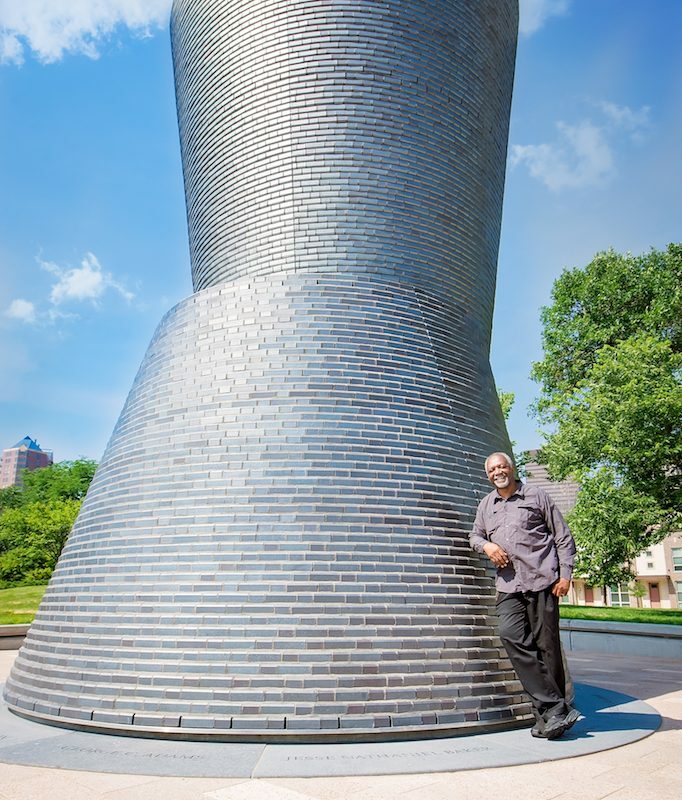 Initiated by the Iowa National Bar Association, the public art project, A MONUMENTAL JOURNEY, honors the courage and legacy of African-American lawyers who founded the National Bar Association (“NBA”) in Des Moines in 1925. Black American attorneys had long sought to address discrimination in their profession, and in 1924, the Iowa Colored Bar Association convened, followed by the founding of the NBA. These pioneering efforts were directed by Iowa lawyers S. Joe Brown, Charles P. Howard, James B. Morris, Gertrude E. Durden Rush and George Henry Woodson who were joined by their colleagues George Cornelius Adams, Jesse Nathaniel Baker, Wendell E. Green, William H. Haynes and Cornelius Francis Stradford from Chicago, Illinois and Charles H. Calloway and L. Amasa Knox from Kansas City, Missouri. All of these founders led this and other efforts to advance justice, uphold the honor of the legal profession, and protect the civil and political rights of all American citizens. The Guardian called the sculpture “behemoth. 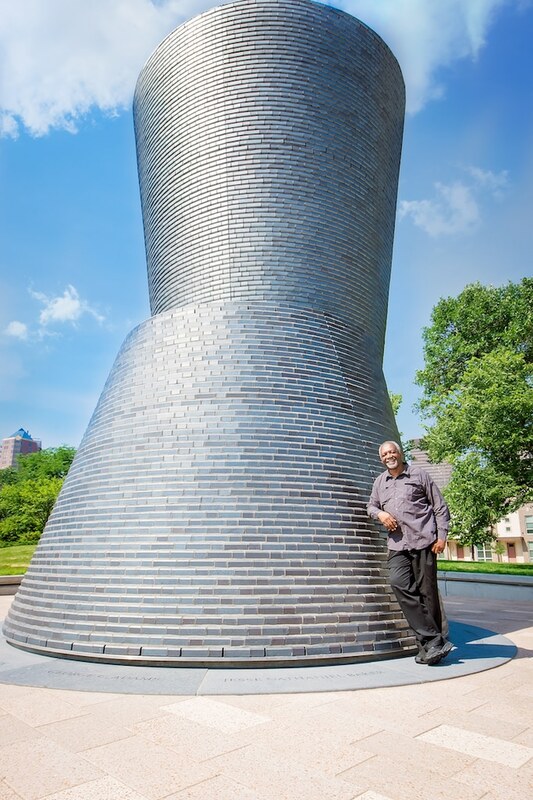 Standing 30ft tall, it comprises two tapered cylindrical volumes, minimalist abstractions of west African talking drums rendered in black manganese brick. They’ve been stacked askew, one on top of the other, and encircled with an inscription of 12 names. They’re the lawyers who, in 1925, founded the National Bar Association, the oldest and largest network of African American attorneys and judges in the country.” Here is the complete article. ArtNet News reported that the realization of A MONUMENTAL JOURNEY is “an important moment in the ongoing push for racial equality has been immortalized by artist Kerry James Marshall.” The timing now seems fortuitous: In the wake of increased calls to remove Confederate monuments, there has also been a movement to erect new ones honoring the accomplishments of African Americans and other minorities whose contributions to US history have all too often been overlooked.